Construction spending shows weakness up and down the line for the private sector in August. Residential spending is lower by 0.7% and nonresidential spending is lower by 0.2%. Nonresidential spending sees declines in commercial, power, and manufacturing. These three nonresidential sectors make up 54% of nonresidential spending. However, this private sector weakness was offset in August by public sector strength that was itself strong across most categories of government spending and rose by a strong 2% on the month. However, in the quarter-to-date, spending is not contributing to GDP growth at all. QTD the consumer sector output for both public and private sectors is at zero. The quarterly patterns echo the monthly pattern with a decline in residential spending (of -6.7% annualized) and a further decline in nonresidential spending (at an annualized rate of -1.6%). Five nonresidential sectors accounting for 68% of the spending contribute to declines on a QTD basis. 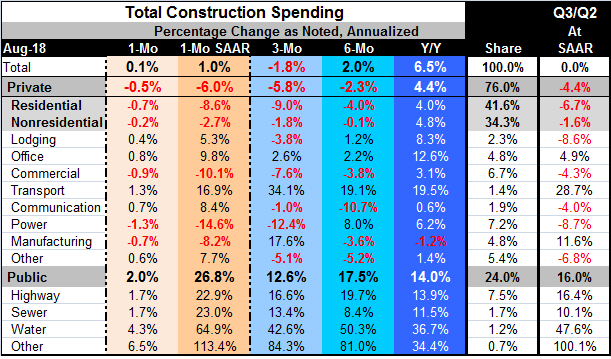 This weakness is offset completely by the public sector where construction spending QTD rose at a 16% annualized pace on gains in all four public sectors. Sequential growth rates (from 12-months to six-months to three-months) show a penchant for accelerating declines in the private residential sector and in the private nonresidential sector. This weakness is not offset by accelerating gains in the public sector, but the public sector is quashing the negative stimulus with steady state expansion. Public spending is expanding over each of these horizons and it is holding to double-digit rates of growth. Meanwhile, the private sector for residential and nonresidential activity each is experiencing a decelerating trend. Within nonresidential there are only two sector with formal decelerating trends; these are commercial and lodging. They account for about 26% of nonresidential spending (although the catch- all 'other' is very close to showing sequential deceleration and it adds about 16% to this total). The economy is showing some signs of slowing and these signs are most apparent in construction. Rising interest rates related to Fed policy are an issue and despite the flat yield curve, which keeps some of the Fed's short-term rate pressure off of long-term rates (that usually is used to finance construction projects), markets are feeling the pressure. While rates are still historically low by the experience of the post war period, so is inflation and people have become accustomed to rates being so low over the past decade. Small rises in rates, therefore, hit consumer psyches harder. In addition, the fact that consumers are carrying a lot of debt means that rising rates hurt them more and hit them sooner than in the past. In the housing market, you will hear real estate related organizations tell you that housing affordability is still good by historic experience. but house prices are very high and affordability is being undermined by rate hiking. Homeowners or potential buyers are not affected so much by the current level of rates but are haunted by concerns of where rates are going and what that is going to do to values in the housing market.